Harvesting and Eating Mizuna | Grow Your Own Veg Blog. Gardening and Food Blog. Mizuna is still growing in our garden from the last year. The plants are now starting to get quite big, so the leaves will picked, sauteed with extra virgin olive oil or as a treat, a small amount of butter. Add to that, a pinch of sea salt and they are ready to be eaten. 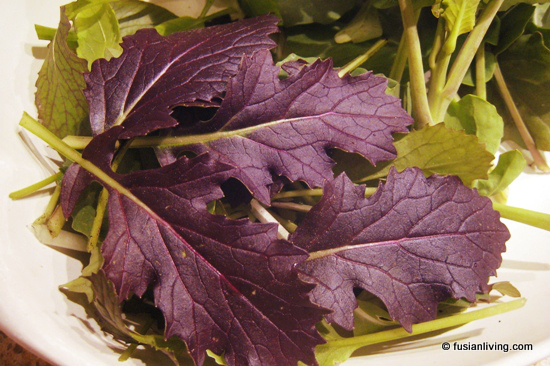 The leaves are wonderfully fragrant, and gloriously purple - and as always, I delight in picking purple vegetables of any kind - purple "Rubi" Pak Choi, purple sprouting broccoli and now the vibrant leaves of the purple "Red Knight" Mizuna. Earlier, the baby leaves were picked and added to salads or to brighten up some of our meals as a kind of garnish. I may sow more Mizuna seeds for the summer, now that its getting warmer, as I like the flavour - its different to the Pak Choi, Kai Lan or Tat Soi that I am used to - with a mild tanginess that gives it an edge over the other Asian greens. Its leaves are an unusual but interesting shape, and make quite an attractive addition to the vegetable patch.